So last weekend I was feeling pretty deflated heading home from Wraysbury earlier than expected without completing my dry suit course. I signed up to the PADI Dry Suit course speciality quite recently because I've been wanting to do some diving in the UK waters and I thought this course would also be good practice before I head out to Malta next week. 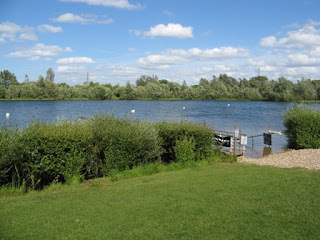 Last Saturday, I got up early and arrived at Wraysbury (muddy bottomed reservoir in the UK) at 9am ready to go! It took until about 11am to finally get kitted up and into the water, but this was fine as everyone was quite relaxed and very friendly. I'd come prepared with some undergarments that kept me toasty warm but were very thin and comfortable, with good "wicking" properties (draws water away from your body). I didn't want to spend a fortune on diving specific clothes so I went to Decathlon and found some hiking undergarments that did the job! Standing on land with a dry suit, BCD, tank - I felt like the Michelin man! I was really struggling to do the most basic of tasks like put on my mask, put on my fins or just generally move about! So I got into the water but I just wasn't sinking so had 18kg added to my pockets!! When we made our way down suddenly a guy surfaced under my legs.This place was crazy - so hectic, too many people so I think this started making me nervous. As we went down I realized I could barely see half a meter. I've only done 4 open water dives in 20m viz. I was trying to hover on a platform (one of the required skills) but started ascending. I managed to get control but then was totally freaking out about the viz so signaled that I wanted to surface. I took 5 minutes floating on the surface then agreed to go back down to a different platform in the reservoir. I managed to do a bit of a fin pivot then had a swim around this platform staying really close so I could see it. Then I started feeling a trickle down my neck so had to surface again. The instructor was surprised I was leaking, but I had pointed out when I tried on the dry suit that my neck seal wasn't that tight before we went in but was told it was ok. It's not like I could just swim around the platform and I was soaking wet, so the thought of getting back in and having to swim in the open with no point of reference terrified me. I also didn't want to stay wet because I had a new tattoo that I was trying to protect! All in all - not what I had expected. I posted about this on ScubaBoard and had some very helpful responses about how I need to get used to a low viz environment first. One poster commented whether I should even be diving in low viz if it scares me that much - but I think this place was exceptionally bad because of how busy it was. Anyway, onwards and upwards! I'm still looking forward to my PADI Advanced Course next week in Malta and then I will try the dry suit course again once I've built some confidence up! My blog has recently been added to Scuba Blogs, which is part of one of the largest networks of blog directories on the Web. Please visit my blog's personal page to vote for my blog and comment to other blog users.